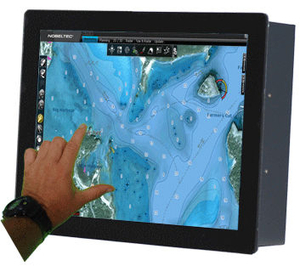 A screen or monitor for ships is an electronic device that displays useful navigation data. These include charts, video surveillance, radar images, meteorological information, speed, heading and more. Those offered on NauticExpo are intended primarily for commercial and professional vessels rather than leisure craft. Such screens are generally multifunction and can display data from diverse sources such as computers, bridge control panels, ECDIS systems and closed-circuit television. They are found aboard all types of ships, from the smallest coasters to the largest transoceanic tankers. These screens are usually waterproof and impact-resistant to withstand the rigors of the maritime environment. Tactile models are operated by the touch of a finger. They offer access to multiple control screens including alarms and equipment management programs. This reduces the required number of physical control panels taking up room on the bridge. Screen size is generally measured diagonally, in inches. Verify that the screen can handle all necessary on-board electronic functions. Connection options vary from model to model; be sure the screen has inputs for all required peripheral devices.